You will need a large stock pot in which to cook the jam and water bath process the jars . Water bath processing is placing filled and lidded jars into boiling water for exact periods of time to process contents preventing spoilage during non-refrigerated storage. Traditional water bath canners may be purchased at hardware stores, Walmart, groceries, dept stores, farm stores, etc. They are large stock pots with a lid and jar holder rack which typically holds 7 quart jars. You do not need a canner if you have a large stock pot and a jar lifter, but if you plan to preserve your produce by canning on a regular basis, you should consider investing in a good water bath canner. Crush berries. 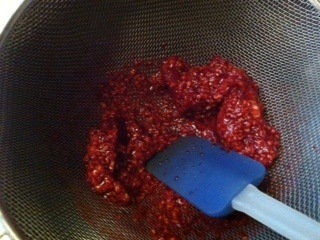 Measure 4 cups of crushed berries into large pot. (Add water to make 4 cups if necessary). 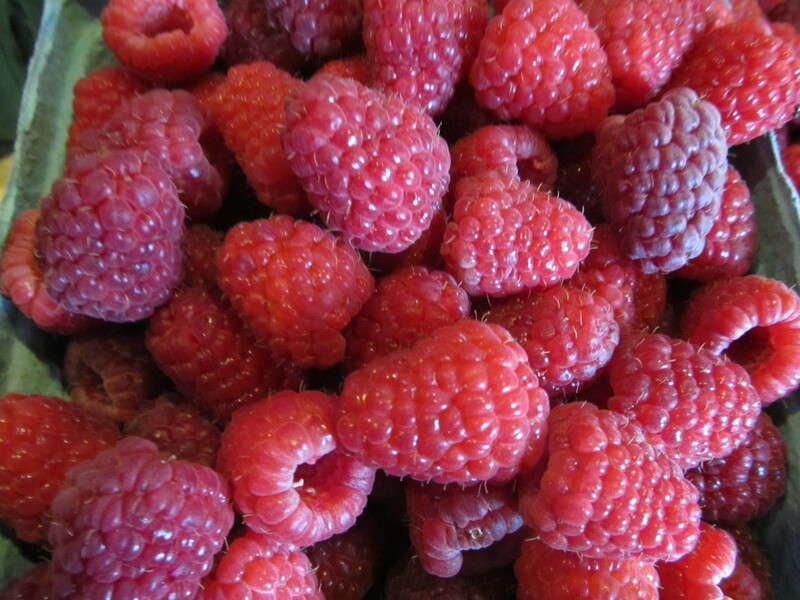 Berries can be crushed with a potato masher or the back of a spoon. If you want to remove seeds, push through a strainer with a spatula or use a sauce maker with a berry screen. A sauce maker is very fast and can be used with other fruits and vegetables to make juice/sauce. I use a Sauce Master food strainer by Norpro. Work the puree with a spatula or spoon until only seeds remain. It takes a few minutes. Add sugar and pectin. Stir to dissolve sugar and pectin using medium high heat and bring to a rolling boil for 1 minute. (Rolling boil means you cannot stop the boil when stirring) Remove from heat. Do Not Shortcut the sugar amount. Sugar is the preservative that keeps jam from spoiling after processing, while stored in the refrigerator during use. Wipe rims to remove any jam from jar lip with damp wash cloth. Any food residue left on the lip, or rough/cracked lips interfere with jars sealing properly. Boil lids and using jar lid lifter, place a sterile lid on the top of each jar. Adjust lid with metal ring band until hand tight. Process jars for 10 minutes in boiling water bath; then remove and let sit undisturbed for 24 hours. *Begin timer when the water begins to boil after the jars have been loaded into canner. You will hear the “ping” of the lid sealing as the jars cool. After 24 hours check each jar has sealed by touching each lid with your finger. If sealed the lid will be depressed. If not sealed, the lid center will pop up and down when depressed. Label jar lid with contents and year. If storing for extended time, remove metal band to prevent it from rusting onto the jar. For short term storage, gift giving, or if transporting, bands should be left on jars. Jam making is quick, easy and delicious. I hope you give this simple life pleasure a try today! This entry was posted in activities, creativity, DIY, food preservation, gardening, gift ideas, Life's Simple Pleasures, PYO berries, Recipe, Seasonal, Uncategorized and tagged blueberries, diy, DIY wedding favor, food preservation, great gift idea, how to preserve fresh berries, jam, quick & easy, recipe, red raspberries, sauce maker, seasonal sweet, water-bath canning. Bookmark the permalink.